At Dizziness and Balance Centers of America we offer the latest hearing aid technology specifically tailored to meet each patient’s budget and lifestyle needs. We provide excellent hearing aid services such as hearing aid selection, fitting, dispensing, servicing, and repairs for adults. Hearing aids offered at our office include the latest Oticon, Widex, and Phonak technology. If you are in need of an audiologist to service your hearing aids obtained at a different office, we are also happy to help! Our hearing aid services are offered through an “unbundled” hearing aid model, rather than a “bundled” package. You will see that most practices currently offer a “bundled” hearing aid model, where fees associated with the hearing aid evaluation, selection, purchase, fitting, and follow-ups are billed in a single charge often resulting in higher prices. At Dizziness and Balance Centers of America we itemize or break out costs of the devices, accessories, and services associated with hearing aid dispensing and bill them separately as needed. By doing this, we offer affordability and transparency of services and concerns of hearing aid costs. Due to this, our hearing aids range from $350 to $2000 each. We will accommodate all budgets! 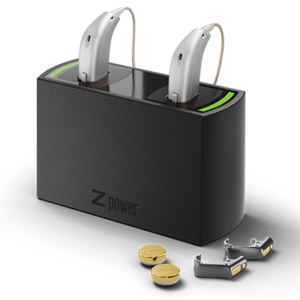 We offer Rechargeable Hearing Aids! How do I prepare for my hearing aid consult appointment? You have made an important decision to have your hearing assessed. By taking this step, you’ll not only learn if you have a hearing loss, you’ll learn about the variety of things you can do to address it. Before you arrive, take a moment to note situations or environments in which you’ve had difficulty hearing. Many people find it helpful to bring a friend or family member to their appointment to share their observations and note important details and instructions. During the appointment, you will be asked about your hearing history, will undergo a hearing test, and will review test results with the audiologist. If hearing aids can help, the audiologist will discuss the best hearing aid styles and features that fit your budget and lifestyle. If you would like to find out if your insurance will cover your hearing aids, please provide us with your insurance information prior to the appointment. As of 2017, Medicare does not cover the costs associated with hearing aids. This means they do not cover a hearing evaluation for the purpose of a hearing aid consult, hearing devices, or hearing aid related services. Medicaid often does cover hearing aid and related services. Some private health care plans may cover the audiological tests, hearing aid evaluation, or even partial or full coverage of a hearing aid. Be sure to check with your health insurance company or your employer’s benefits manager to find out.We will work with your you and your insurance company to be sure you get every penny of coverage available to you. If you have hearing loss in both ears, you are most likely a candidate for two hearing aids. By wearing two hearing aids, you will achieve better understanding of speech, which will be further improved in noisy situations. Wearing two hearing aids will also improve localization of sounds and provide a wider range of sound. But most important of all, wearing two hearing aids will keep both ears active resulting in less hearing loss deterioration. How will I know if the hearing aids will work for me? Adjusting to hearing aids varies from person to person and depends upon how long you waited to treat your hearing loss as well as its severity. Hearing aids will not restore your hearing or worsen your hearing. You will need to wear your hearing aids regularly and consistently for you to get adjusted to them. Some people will notice that sounds will be louder and slightly uncomfortable when wearing hearing aids for the first time due to going so long without treating their hearing loss. 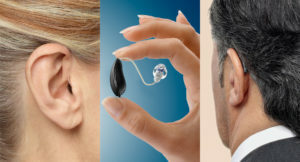 We offer latest hearing aid technology demonstrations in-office. We also offer a risk-free 30 day trial period. If you are unsatisfied with the hearing aids, you will get a full refund for the amount paid for the hearing aid devices. Hearing aid pricing in our office will range depending on the level of technology. We offer hearing aid products at all price points to meet your budget. Our pricing is very competitive in the Greater Houston Area. And to keep our competitive pricing, we offer an unbundled model for hearing aids. Our unbundled model includes the cost of hearing devices, dispensing fee and visit, and one follow up during trial period. An unbundled model allows the patient to pay for services and accessories as needed, and save around $1000 on most types of hearing aids. Which hearing aid brands do you offer? What is the difference between over-the-counter (OTC) devices and hearing aids? OTC devices are pre-programmed hearing devices for adults with a mild to moderate hearing loss purchased directly by consumers from a retailer or online. No medical clearance or hearing evaluation is necessary to purchase these. Because of this, there may be medical contraindications or signs that may be overlooked when purchasing OTC devices without consulting hearing loss with a physician or audiologist first. These medical signs that may be overlooked can include ear infections, otosclerosis, acoustic neuromas, or simple ear wax accumulation. While the OTC devices are affordable, they cannot be adjusted to fit the wearer’s hearing evaluation results and follow a “one size fits all” approach, resulting in an inaccurate fitting that may not be beneficial. Hearing aid devices are selected specifically for the patient’s needs based on hearing evaluation results and lifestyle. 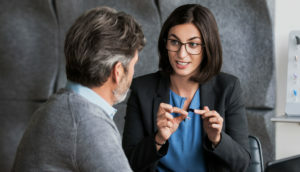 A comprehensive hearing evaluation by an audiologist must be performed prior to selecting hearing aids, to additionally rule out medical contraindications. Hearing aids are the perfect solution for all ranges and types of hearing loss, from a mild hearing loss to a profound hearing loss. They are available in many styles and sizes, as they can be custom fit to the patient’s ear. The hearing aids are programmed and calibrated specifically for the patient based on objective and subjective measures. When purchasing hearing aids, you additionally receive ongoing hearing aid service, training, and support if they ever need to be re-programmed or adjusted. The beauty of hearing aids is that they are completely programmable at the audiologist’s office if your hearing ever changes or if sound quality is not ideal. In addition to amplification, most hearing aid technology offers tinnitus sound therapy integrated. You get what you pay for. Saving a little it of money on an OTC device that is not properly fitted to your hearing and for which you do not receive service is not considered a great value. An audiologist is academically and clinically trained to select and program the best hearing aid technology products to fit your specific hearing and lifestyle, as well to offer face to face service with expert fittings and advice. If cost is a concern, we can assure you that we will find something appropriate for your hearing and within your budget. Attention Winter Texans, Snow Birds, or Temporary Residents! We are happy to service your hearing aids during your stay in Houston area, please give us a call to discuss your needs.